These faired-in covers have been designed to replace the Chimaera's standard plastic headlamp shrouds and fit over the top of the existing TVR lights. This kit is FULLY reversible and doesn't require ANY permanent changes to the bodywork. After being assembled as shown in the instructions below, these simple faired-in headlamp pods create a very similar look to the last versions of Chimaera to leave the TVR factory which had 'MK3' faired-in lights as standard. Rather than being a permanent modification the replacement pod simply bolts to the car in exactly the same way as the original painted shrouds - by using the same fixing holes and a small blob of sealant at the top rear edge. The kit includes a new pair of cowls - very similar in shape to the originals, but re-shaped around the circumference to allow a 3mm thermoformed lens to sit into it and flush with the surrounding bodywork. These cowls are painted matt black as standard, or can be body coloured at small additional cost. Alternatively they can be supplied in 2-pack primer for final painting by the customer. The outer lenses are available in lightly smoked or completely clear 3mm acrylic, and have a parallel black border around the full circumference as standard. By far the most popular option is the combination of lightly smoked lens and matt black inner cowl. This gives the Chimaera a very distinctive look that really suits the car, which can also change depending on the viewing angle and natural light. The French registered silver Chimaera in the gallery above is a good example of how the lens can appear much darker than it actually is due to these combined factors, and for comparison, the lenses on the blue car in the next picture to the right are completely clear. This kit of parts can also be adapted to fit over the top of the popular Lupo conversion with great results. Full DIY instructions for fitting Lupo's with faired-in covers can be found in the dedicated section in the drop down menu. This conversion also uses a custom-made fibreglass cradle, moulded to match up to the underside of the Lupo light housing, to cup the Lupo unit in position and support its weight whilst it is being aligned and finally sealed in place. 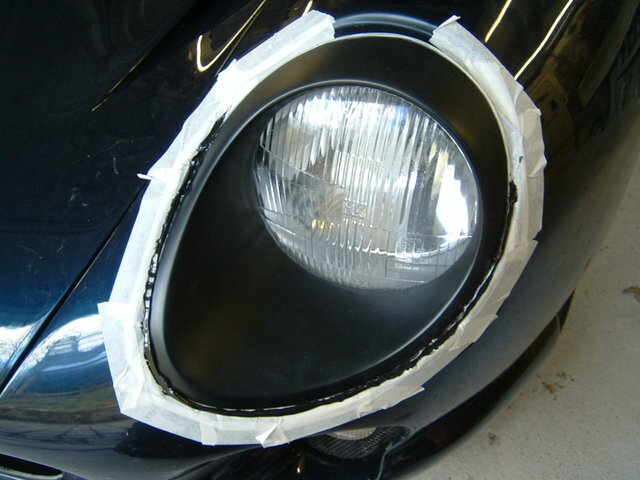 This work involves cutting away much of the original headlamp aperture and isn't reversible. 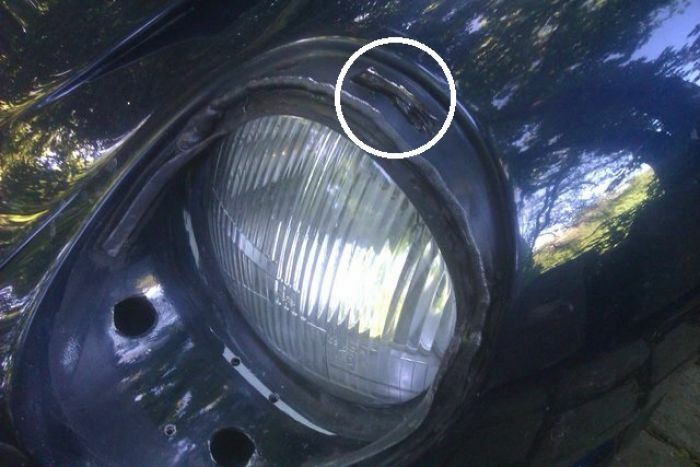 The angle of the Lupo unit when fitted in the Chimaera light aperture is pointing slightly inwards compared to their fitment in the VW - as a result the adjustment of the reflector needs winding outwards to compensate and get the light beam pointing straight ahead. This misalignment is not noticeable from the outside, however, there will be little, if any, additional outwards beam adjustment available after fitting. The images below illustrate how the smoked lens looks with the black border over a matt black cowl. The perspex only has a very subtle smoked tint and has no noticeable effect on lighting output, however, anyone concerned about this could simply fit modern brighter bulbs such as Philips Nightbreakers which will more than compensate for the smoked lens. 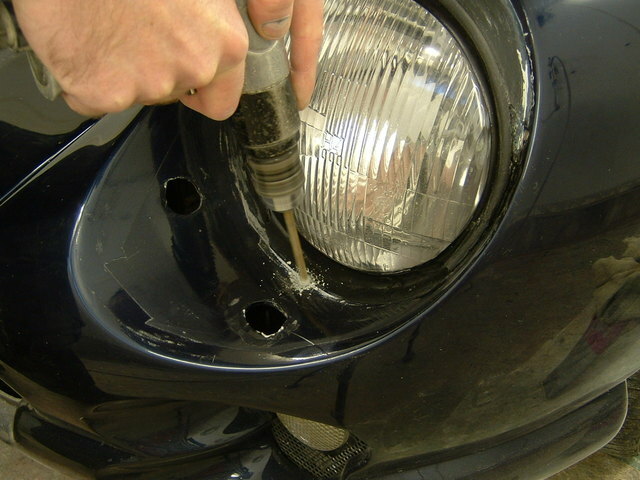 In the vast majority of cases, no bodywork modification will be required at all and all the parts of the kit will fit straight into place, although, as all TVR's vary slightly, with a minority of cars the area directly above the headlamp bowl where the replacement cowl sits may need sanding down to round off the leading edge - (pictured in the instructions at Step 3) to provide enough clearance for the new inner cowl to sit in place properly. If the clearance above this ledge isn't adequate it will prevent the matt black cowl from sitting low enough, and as a result the outer faired-in cover may sit slightly proud of the surrounding bodywork. This slight modification to the ledge profile may be necessary due to a combination of reasons such as previous repair work, and excessive build-up of filler / primer / paint / lacquer, and also the original body mould used during manufacture. Test assembly of the new inner cowl, with the outer lens placed over it, will instantly reveal whether any excess needs removing from the shelf. If the outer lens sits flush to the surrounding bodywork then no extra work is needed. If however, the cowl is sitting too high on the shelf, and as a result preventing the outer lens to sit flush to the exterior bodywork, then material will need removing as described in the assembly instructions below. After grinding down, remember to re-coat any exposed fibreglass on the ledge with a touch up stick or a smear of sealant to protect the bare GRP. Before starting to fit the kit, the old sealant around the headlamps will need trimming and the general area under the original shrouds will need cleaning and tidying to remove any old mastic, but the whole assembly can be easilly DIY fitted as the pictures and video below illustrate. For anyone not wishing to attempt DIY assembly, there is also the additional option of having the faired-in kit fitted at the workshop in Halifax. The total assembly time is only several hours, but the separate stages of assembly will require allowing the bonding sealer to cure overnight before moving onto the next stages, so it is recommended that 2-3 days are allowed for fitting including sealer curing time. ASSEMBLY PROCESS - Standard Headlamps. USE THE YOUTUBE VIDEO FOR GUIDANCE ALONGSIDE THESE INTRUCTIONS. SOME MINOR DETAILS MAY NOT BE SHOWN ON THE VIDEO BUT ARE DESCRIBED BELOW. A SIMPLER ASSEMBLY PROCEDURE IS AVAILABLE WHICH ELIMINATES SEVERAL OF THE STAGES SHOWN BELOW. THE NEW PROCESS DOESNT REQUIRE FITTING THE RUBBER SEALS (SHOWN IN STEP 5) OR HAVING TO APPLY NON-DRYING GUTTER SEALANT (SHOWN IN STEP 14). INSTEAD, THE OUTER CIRCUMFERENCE OF THE FAIRED-IN POD ASSEMBLY CAN BE FULLY SEALED TO THE CAR USING BLACK SILICONE TO PROVIDE WEATHER PROTECTION. SEE PICTURES AT THE BOTTOM OF THE PAGE FOR THIS NEWER SIMPLER METHOD. Firstly, the original plastic headlamp shrouds will need removing - They're simply attached with a pair of nuts / wing nuts protruding downwards underneath the aperture - accessed from the grille opening, as well as a blob of mastic on the ledge at the top. All of the old sealant on the bodywork ledge - directly above the glass headlamp bowl - will need cleaning off to allow the faired-in kit parts to sit in close contact and flush with the surrounding bodywork. Examine the sealant bead securing the glass bowl in place - if it is damaged and / or applied in a thick bead then the headlamp glass will need cutting out, all the old sealer removing, before being refitted, sealed back in place, and the sealer thumbing-in smooth to avoid any build-up that could obstruct the new parts of the kit, as shown in the following pictures. This is a good oportunity to clean the glass headlamps and make sure the reflectors are clean before proceeding with the faired-in covers. If the existing sealer securing the glass headlamp bowl in place is already neat and thumbed-in smooth, and the inside of the bowl and reflectors are clean, then there is no need to remove and re-seal them, and move onto the next step. Next, drill a drain hole in the lower part of the headlamp aperture, in the centre, just in front of the headlamp glass. This hole provides ventilation to prevent misting up of the lens, as well as a means of drainage if any moisture found its way behind the pod assembly. Remember to touch up the exposed sides of the drilled hole to protect the fibreglass. The replacement cowls can now be test fitted for shape and size within the headlamp recess. Allow the cowl to sit in place and check that the outer faired-in cover can be placed over it and rest in position nice and flush to the surrounding bodywork. The faired-in outer lens has a good degree of flexibilty and can be manipulated into position if necessary without any trouble. Rotate the faired-in cover slightly clockwise / anticlockwise until the 'sweet spot' is found and the lens fits nicely around its circumference - even if it needs a little external pressure to keep it in position. It is perfectly normal to have to manipulate the lens slightly to get it 100% flush - it may want to flex slightly at the sides, and may not be 100% flush with the bodywork when initially offered into position, but when taped down firmly to the bodywork the lens will follow the correct profile of the headlamp aperture and be flush all the way around the circumference. Later on during final bonding stages the outer lens will require pulling down flush to the bodywork and will require taping down firmly until the sealer sets so dont worry about having to flex the lens slightly as this is perfectly normal. The important thing at this test-fitting stage is that the inner cowl is not preventing the outer lens from sitting flush. If the acrylic outer lens is being prevented from sitting flush by contacting the top of the inner cowl beneath it, then the bodywork 'ledge' above the headlamp glass needs shaving down to allow the inner cowl to sit a little lower. Remove any excess paint/primer/GRP from the leading edge and top surface of the upper ledge (pictured) by sanding or carefully grinding with a flat disc. 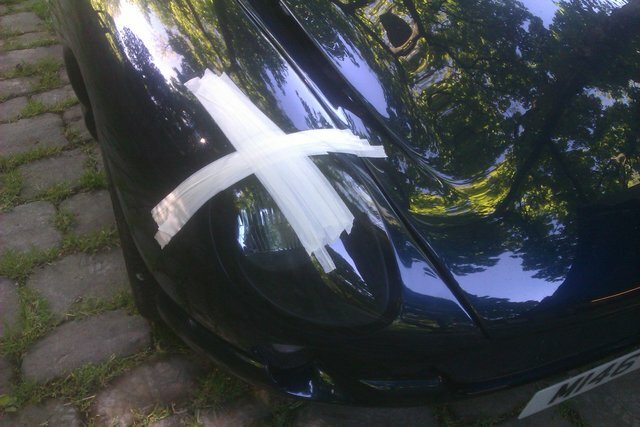 Mask out the surrounding bodywork to protect the paint if necessary. 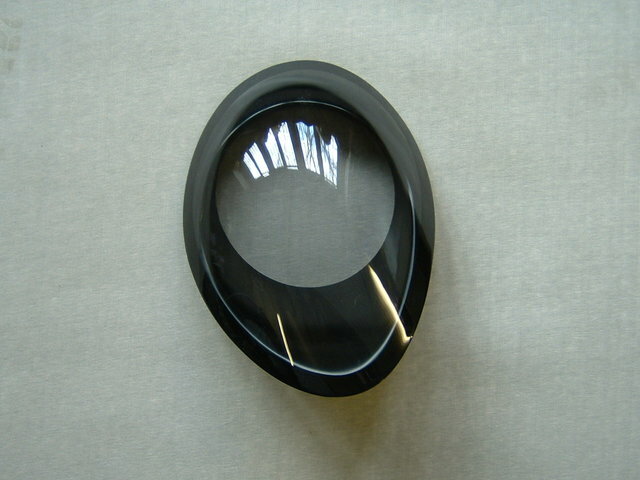 The acrylic outer lens needs to sit in close contact with the inner cowl to be flush to the surrounding bodywork but with enough clearance to sit in position without requiring excess force. 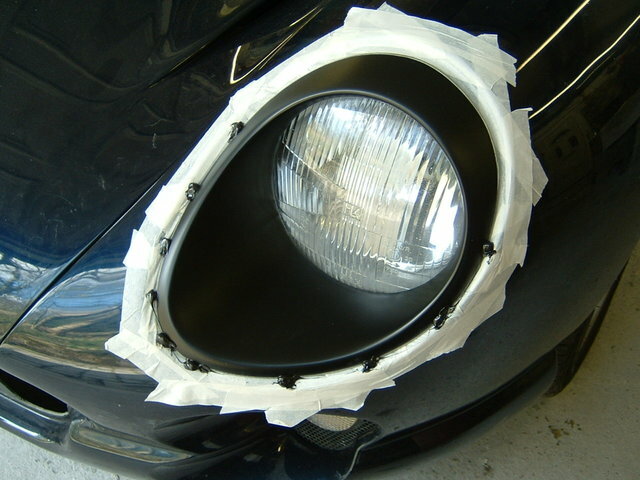 Remove enough material if necessary to allow the cowl and outer lens to sit nicely in position. Its also a good idea to not have the circular opening of the cowl section butting right up to the headlamp glass - a small gap will aid airflow around the pod. Any adjustment or trimming of edges must be done to the cowl at this stage to prevent fitting problems later when the parts are bonded together. The cross section diagram at the bottom of the page shows a more detailed illustration of how the parts of the kit fit together when properly assembled. Next, offer up the base plate, make sure it sits centrally in the bottom of the headlamp aperture with an equal gap around the sides. Mark the position of the fixing holes in the bodywork on the underside of the base plate, drill the holes, and fit the fixings as shown. Make sure this assembly tightens up nicely to the car. This fibreglass piece is relatively thin and is therefore flexible enough to properly conform to the shape of the aperture when it is fully nipped up tight. After test-fitting, refit it in place with the polythene sheet underneath for the filling stage. Now glue the channel sections of drainage rubber into place using superglue. The rubber channel has a flat side and a curved side - The flat side needs gluing to the bodywork following the edge of the aperture and positioned around 5mm down inside from the edge. Note the way the ends of the rubber are cut to match up nicely to the bodywork next to the headlamp glass. This makes it easier to seal this area at the final stage using non-drying gutter sealant. As well as diverting water away from behind the pod assembly, these rubbers also prevent any light escaping from behind the edge of the assembly as can sometimes be found with the original plastic shrouds when viewed at certain angles. The rubbers supplied with the kit are pre-cut to length, with the ends pre-cut at the correct angles to fit into place, and labelled to ensure they are fitted correctly. Next, open out the polythene to protect the rubbers and adjacent paintwork. Remember that using filler and bonding sealer can be messy and rubber gloves are recommended. Apply a bed of body filler onto the fibreglass base plate. (Note - Body filler is not supplied in the kit and will need supplying separately). Avoid applying the filler too heavilly or too close to the edge of the base plate where it may squeeze out and become seen. Body filler is used in this example because of its strength and rigidity providing a solid base when cured. Sikaflex/polyurethane sealant, and other joining methods could be used but drying times will be considerably longer involving additional curing time before progressing. Remember also, if these two parts were joined using Sikaflex, because of the thick amount needed, it may appear cured on the outside yet only be skinned-over and still liquid on the inside causing prolonged curing times of between several days to maybe a week in cold temperatures to fully through-cure. To avoid this, where possible, a quick solid-drying filler (pictured) or fibreglass paste should be used. The cowls can now be sat into the filler BUT WORK QUICKLY WHILE THE FILLER IS STILL WET and test-fit the lens by placing it into position on top of the inner cowl and taping it down flush to the bodywork. GET THE LENS SITTING FLUSH TO THE BODYWORK AND TAPED DOWN FIRMLY IN POSITION WHILST THE INNER COWL IS STILL FREE TO FIND ITS FINAL RESTING POSITION BEFORE THE FILLER SETS HARD. This ensures that the cowl is sitting in the correct position and not sticking proud at any point which would prevent flush fitting of the lens over the top. When the filler has dried (15-20 mins in ideal conditions, longer in cold weather) remove the tape holding the lens down, unbolt the cowl assembly which will now be a complete item with the base plate attached, and remove the polythene. Remove any unsightly excess filler that may have squashed out where it could be seen by using a dremel, grinder, or by hand filing. Wear eye and face protection when dealing with filler dust. Fill in any gaps where the filler didn't contact the two halves properly. Now the back of the cowl assembly can be masked out around its circumference. Tape firmly onto the underside of the flange without any gaps in the tape. The cowl assembly now needs bolting to the car, centrally in its aperture, with even clearance around the sides for the lens to sit nice and flush. Tape down the cowl to the bodywork as shown in the pictures. Use extra protective strips of masking tape around the headlamp recess to prevent any excess sealer contacting the vehicle paintwork. Either - apply the sealer in a full bead if confident (shown in STEP 11a). Apply small blobs of sealer at intervals around the flange to avoid excess amounts of sealer squashing out into the visible part of the pod assembly (shown in STEP 11b). IN BOTH CASES, DO NOT APPLY SEALER AROUND THE TOP HALF OF THE COWL AS THIS SECTION IS SEALED AFTERWARDS FROM THE UNDERSIDE. If applying a full continuous bead, the objective is to apply a NEAT bead of sealant, no more than around 3mm in diameter, to the very edge of the flange next to the taped edge. DO NOT apply the sealer too thick or too far inwards on the flange as it may squash out beyond the black border area of the lens and become visible. CARE MUST BE TAKEN. The following picture shows the sealant being applied in one continuous bead down both sides and around the bottom of the inner cowl BUT NOT AROUND THE UPPER SECTION. (The upper section is sealed afterwards to remove the risk of the sealer bead compressing and squashing out past the black border. The fitting tolerances are tight in this area meaning that there is little room for error when sealing, so this upper section of the lens is best sealed from the reverse side afterwards by thumbing-in the sealant into the tight gap). 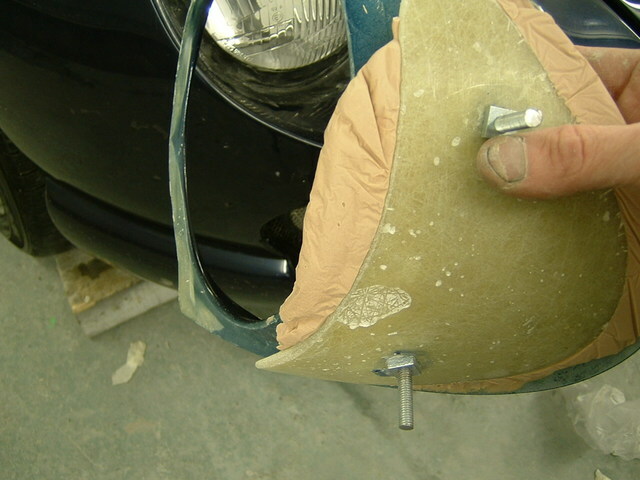 An alternative, and much safer sealing method, is to just apply small blobs of sealer at regular intervals around the edge of the flange - just enough to hold the lens in position on its inner cowl when cured (as shown in the folowing picture), but as above - DO NOT SEAL THE UPPER PART. Applying the sealant in spaced-out blobs like this minimises the risk of it being over-applied and spreading out beyond the black border of the lens. The gaps between blobs can simply be sealed from behind after the blobs have set and the outer lens is adequately secured to the cowl. Now place the lens onto the wet sealer and tape it down flush to the body. Use as much tape across all sides as necessary to hold the lens securely in position. Usually just the top half of the lens and the front leading edge will need firmly taping down, but also check the sides and use as much tape as necessary to keep the lens sitting nicely in position and not proud to the bodywork. As all TVRs vary slightly, the lenses may need taping down differently from car to car to make them sit flush. Don't worry about excess sealer coming from behind the lens and out onto the masking tape as this can easily be trimmed off when cured. The important thing at this stage is being happy with the position of the lens in relation to the surrounding bodywork and then allowing the sealer to cure overnight. Remember that when the sealer has dried, the individual parts of the headlamp kit are now in their final positions to each other and cannot be altered, so be patient to ensure the lenses are well positioned and taped down properly while the sealer cures overnight. After being left to cure overnight, unbolt the entire pod assembly, remove all the tape applied around the edge of the cowl and on the bodywork. Thumb away any cured sealer from the face of the lens (adhesion will be poor on the shiny surface and stray sealer won't be hard to remove). With a very sharp blade, carefully trim away any excess sealer from around the edge of the lens, and then fully seal any gaps in the sealer bead around the full circumference from the underside of the pod assembly - including the upper section deliberately left in the previous stage. Take care not to thumb-in too much sealer which may spread into the visible part of the lens - just enough to fill the gap between the cowl and lens, and bond the two together. Now apply a slim bead (approx 3-4mm diameter) of non-drying gutter sealant around the upper part of the headlamp recess and down into the rubber gutter channels (seal down into the channel part of the rubbers at least 10mm). Thumb some sealer underneath the rubbers for additional waterproofing. Place this sealer bead on the ledge above the headlamp glass so it contacts the underside of the cowl and creates a seal. Any excess that comes out from the circumference of the pod onto the bodywork isn't a problem as it can be easilly wiped away. When applying the gutter sealant, aim to make the height of the bead just enough so that it fully contacts the underside of the pod assembly when the pod is fully bolted down, and creates a continuous unbroken waterproof barrier around the upper part of the finished pod assembly. It is essential that there are no gaps in this sealer bead as it would allow water to run down inside the pod and over the headlamp glass. Always use the non-curing gutter sealant for this section around the top of the headlight bowl and down into the rubber channels. Apply a tiny blob of the polyurethane lens sealer to the top centre of the aperture (further upwards from the gutter sealant bead) before refitting the pod assembly. This will contact the underside of the pod assembly at the very top and should be taped down overnight whilst drying. Check for any excess sealer squashing out from behind the pod assembly and wipe away using panel wipe / degreaser. Only a small blob is needed just to hold the rear edge of the pod down to the bodywork as with the original painted plastic shrouds. Remember if the pod is ever to be removed for whatever reason then this blob will need slicing through to release the pod from the bodywork, so excessively sealing this area would only make the removal job harder. Now, bolt the finished pod to the car, and tape down the top edge whilst the final Sikaflex blob cures overnight. After leaving to set overnight, the pod doesn't need to disturbed again. The final job is to remove the masking tape, clean away any residue. The finished faired-in pod is now completed and the vehicle can be used. The cross section diagram below shows how all the sections of the kit fit together when fully assembled. 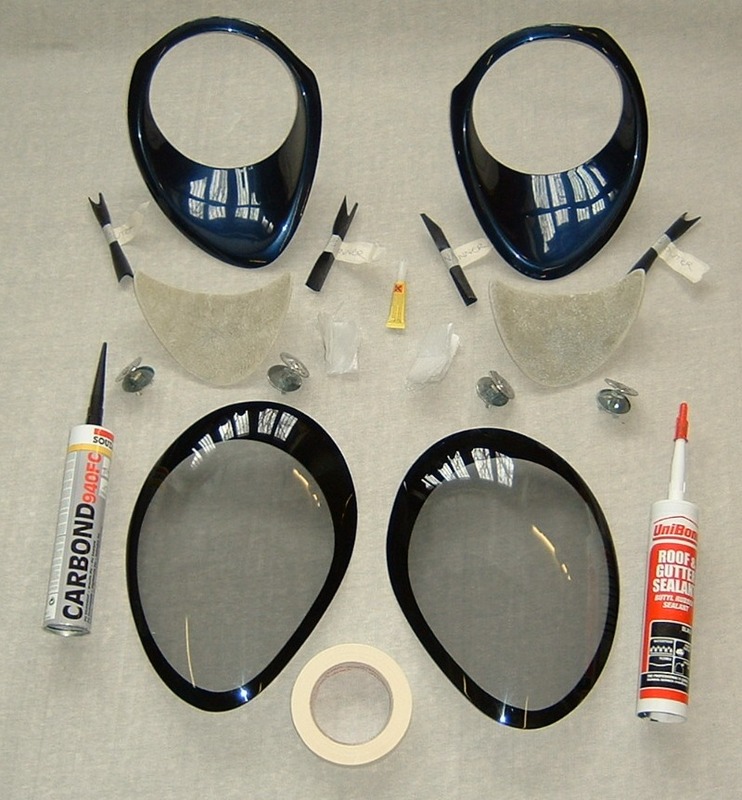 The full kit includes all the parts pictured below which includes a pair of faired-in covers, a pair of fibreglass inner cowls (in matt black as standard), a pair of fibreglass mounting plates, as well as all the fixings, rubbers, superglue, tape, sealant, etc, but DOES NOT INCLUDE body filler required at step 6 above. Where the term 'Sikaflex' is referred to in these instructions, it relates to the polyurethane sealant supplied with the kit, which may be an alternative brand such as Carbond (pictured below). 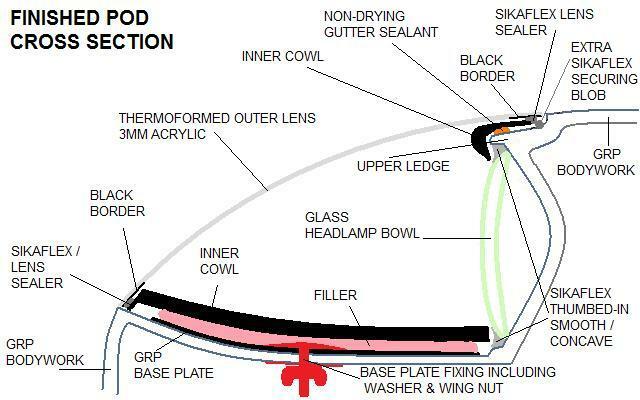 The POLYURETHANE sealant is used to bond the outer lens to the inner cowl, and to secure the top of the pod to the bodywork as described in Steps 11a, 11b, 12, 13, and Step 16 above. The RUBBER BUTYL sealant (gutter sealant) is non-drying and only used to weatherproof the pod assembly and prevent water getting behind the finished pod assembly as described in Step 14. This non-drying sealant seals the faired-in pod to the car bodywork and allows he pod to be removable if necessary. 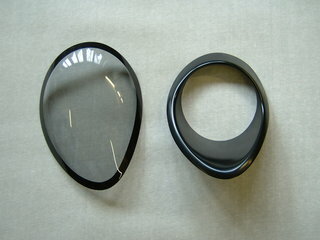 The picture below is provided for illustration purposes to show the kit items, however some minor details have since been updated such as the shape of the cowls around the upper half and the width of the black border on the outer lenses as been reduced around the upper part to make it parallel all the way round the circumference. To make this installation as simple as possible, the rubber seals shown in Step 5 can be omitted, and the non-dying gutter sealant shown in Step 14 is not required. Instead of carrying out Steps 5 and 14, the assembly process can be followed from 1-4, then from 6-13. Now test fit the pod in place and mask around the edge of the lens (this is to prevent sealant touching the Perspex) and also mask a neat parallel border onto the cars bodywork approximately 2-3mm wide as shown in the pictures below. Then remove the pod from the car, apply the small blob of black polyurethane (PU) sealant shown in Step 15, and then apply standard black silicone as shown (suitable for outdoor use) and refit the pod assembly onto the wet silicone. Fully tighten up the pod until the sealant squeezes out, and then neatly thumb over the joint line. Remove the masking tape and leave to set overnight. The assembled pod is now weathertight and the fitting process is complete.